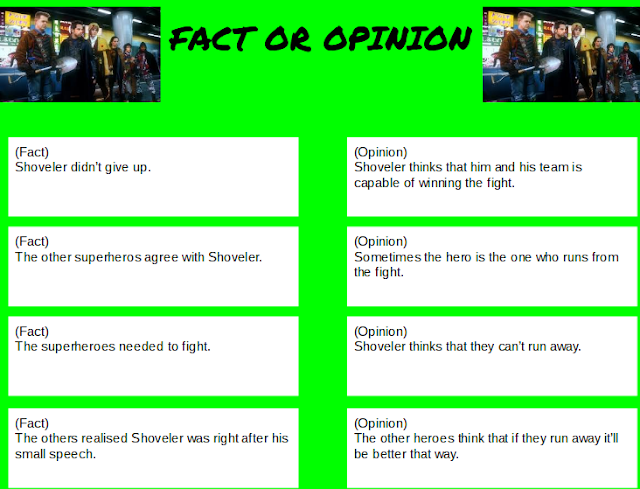 This week for reading we did a small activity about fact and opinion. We had to watch a short clip from the movie Mystery Men, and then come up with 4 facts about the scene, and then come up with 4 opinions about the scene. After that activity we had to do a Main Idea Summery Frame about the scene. A fact is something that can be proven by a single answer, while on the other hand opinion is what 1+ people think of something, yet other people think otherwise. From this activity I've learnt about how to find a fact in a video or text, and how to find someones opinion in a video or text. I think the main idea of this text is about Shovelers speech about why they shouldn’t run away. One example of a supporting detail is that the majority of the scene is Shoveler giving his speech about this topic. It is clear that the main idea is about Shovelers speech about why they shouldn’t run away. Because that’s what the scene is about both by name, and by what is seen.